Available for free download on Amazon between now and August 12th, 2014. I am so impressed with Chad A. Clark. Borrowed Time and other tales, is a collection of short stories with a brilliant mix of paranormal, sci-fi, horror, and fiction. By the first story, Misty Highway, I was hooked. 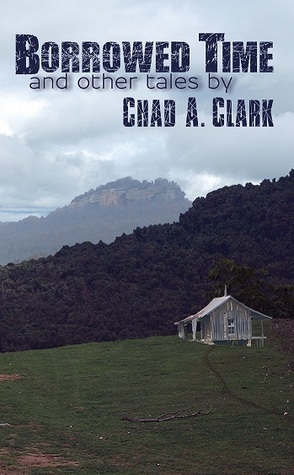 Chad's story lines, character development and ability for building suspense are first rate. His prose, poetic: "...It rumbled to a stop just ahead of her and, as she walked past, she got a good view into the back seat, where the flooring had become a seabed, lost underneath a vast ocean of generic brand soda and energy drink cans...(Kindle 4%)" "...June looked around the car again. The waves of the empty cans lapped up onto a beach of fast food bags and candy wrappers...(Kindle 4%) I just love the use of the ocean and beach in his description! A diverse and well executed collection of stories ranging from horror to weird to literary. My favorite story in the collection is the first one: Mist on the Highway. In the vein of Rod Serling and Ray Bradbury, it's a story that rewrites itself as you read it, constantly making you second guess your assumptions about what is really happening. Another story in the collection, Falling to Dark was scary enough that I couldn't read it at bedtime without unduly influencing my dreams.Full disclosure: I received a free copy of this book in exchange for an honest review. Great read! !Great read! !Excellent story lines and intertwining of characters. Definitely enjoyed this...Will look for other works from this author. Couldn't put it down!